We have had a lot of rain lately in the Kansas City area, which is great for our plants and flowers. All of that rain is also good for one of our least favorite pests – mosquitoes. As we all know, it’s hard to enjoy our outdoor spaces in the summer with those things buzzing around our heads. Plus, we also want to keep our eyes on if the West Nile or Zika viruses make their way to Kansas City. There are some things we can do to help keep the mosquito population down. Skeeters, Skeeters, Go Away. Come Again Some Other Day! 1. Keep your vegetation trimmed. Mosquitoes like to rest on weeds and other vegetation, so keep your lawn mowed and your bushes trimmed. 2. Empty out any containers in your yard that may have standing water. This can be old flower pots, tires, pet dishes, or that old wheelbarrow that collects water in the corner of your yard. 3. Keep your gutters clean so water doesn’t sit there and provide a perfect breeding ground. 4. Clean and change the water in your birdbaths every few days. The birds will like it, AND the mosquitoes will hate it. 5. Fix drainage issues where you have large puddles of water standing after a rain storm. You can also treat your lawn and landscape with a treatment that can kill mosquitoes and prevent them from laying eggs. 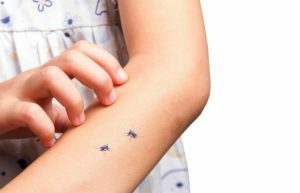 These treatments can usually last 21 days, and a regular program can really reduce dramatically the amount of mosquitoes in your Kansas City area home. These types of mosquito treatment programs are best left to professionals. Contact Green Head Turf, and they will be glad to answer any questions regarding how to keep those pesky mosquitoes away from your home.